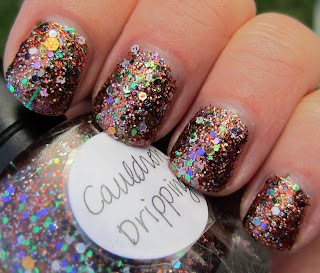 Here's a look at Lynnderella Cauldron Drippings, which I've had a number of requests for. This shade is one that will be included in her next offering, Early Halloween. All of the photos were taken outdoors under partly cloudy skies, and I used three coats. 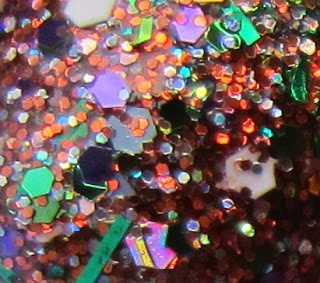 As with most Lynderella polishes, this one has a lot going on! But it all comes together creating a unique and beautiful blend of colors that works perfectly for the Fall season and Halloween. There's a multitude of foil glitter shapes and colors, and the base is a clear one with a purple/grey tint. The small orange hex glitter emerges as the prominent one, giving the polish a coppery look. Add in all of the other colors, and this is one of those shades that seems to look a little different in every picture. The application was quick and easy, and the color builds up very evenly. The glitter lays flat and the drying time was much faster than I anticipated. As I applied this shade, I thought it had a charcoal tinted base, but upon closer inspection swatched on paper, it looks more purple. When looking at it on the nail, the base looks like a soft black. Every now and again I caught a flash of coppery pink, as you can see on my pinkie finger in the second photo above. To be honest, I am so entranced by all of the other colors that I don't actually see too much of the base color! I'm not certain exactly when the Early Halloween Collection will be available, but if you follow Lynn's site at the link above, that will keep you informed. oh my freakkkkkkkk.... I love this! I LOVE this! A home run with this! That is so unique and interesting - perfect for Halloween! I can't wait for the Early Halloween collection to go up for purchase and to wear the Lynnderellas I already have! I wish she'd sell individual polishes. Oh lawd this looks amazing I need to save my pennies I'm going to want every color she comes out with! Thanks for sharing! This is such a cool combo of glitters!! I usually don't like glitter but this is worth taking a look at. I will have to follow her to find out when I can buy this. This is one special polish. Just gorgeous and I love it. I have to have this beauty. That is a whole LOT of glitter. I am surprised it paints on and does not have to be put on as dry glitter onto a nail with glue on it or a bunch of wet nail polish to catch all that! Lovely np, loving the different glitters!